The hour is upon us. The recipe books are off the shelf and planning has begun for one of the most spectacular food days of the year. Or not. I do love this holiday, but I am a bit of a traditionalist. I pull out the familiar recipes that I love and don’t ever make except at Thanksgiving. I mean who makes cranberry sauce for a fancy dinner party unless it’s Thanksgiving? I do have several recipes that I shared last year a little too late for anyone to use, so here’s my Thanksgiving Turkey post. But enough said about Thanksgiving. What I want to write about today is something I’m thankful for: chanterelles. It’s mushroom season here in the Northwest and I have been lucky enough to head out to the woods a few times and find some. Last weekend was the more notable journey. I went with 3 other women, their only link being me. I took a chance and put the overnight trip together hoping that everyone would be compatible. It was a bit of a risk since we were all staying together in what turned out to be a tiny, one-room cabin with a kitchen and spent the day walking around in the woods in the rain. But, gratefully, all of us share a passion for being outdoors and good rain gear, so it worked. And even better, we struck gold and found lots of beautiful chanterelles. 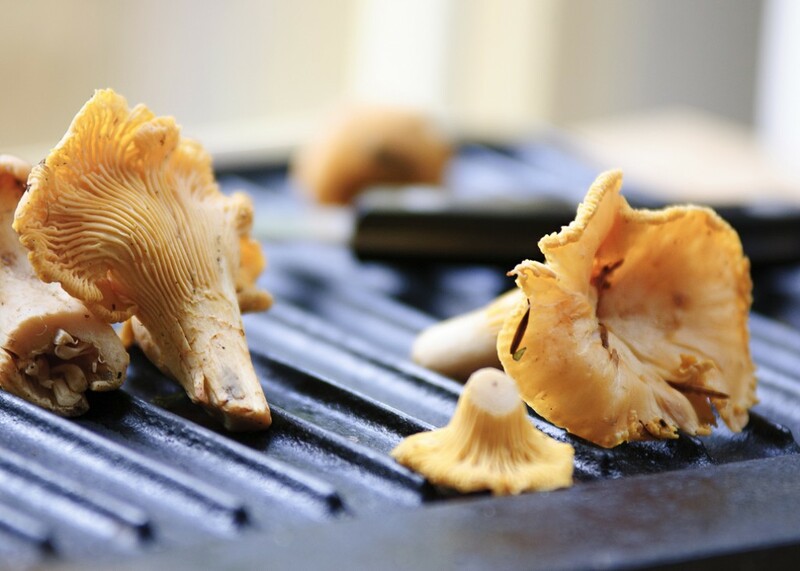 It is like hunting for treasure in the forest when you go searching for mushrooms. You search and search in the moss and that sudden sight of a little golden top peeking through the green is truly a thrill, especially if you start to spot another little head and another one and another one. We brought our treasure happily back to our cabin, creatively hung all our clothes around the room to dry and made a spectacular pasta dinner. The windows steamed as we drank wine, dried off and feasted on our bounty. And while I said I was thankful for chanterelles earlier, what I’m truly thankful for is that there are at least 3 other hardy women out there who can find pleasure spending a day in the forest wandering around in the rain and I’m lucky enough to know them. 1. Put a pot of heavily salted water on to boil. 2.Put a large skillet on high heat for one minute. Add the butter and olive oil. When butter melts and foams, add mushrooms to cover the bottom of pan. You don’t want to crowd the pan, so hold back some of the mushrooms. After the mushrooms in the pan start to absorb the butter/oil and brown a bit, add the rest of the mushrooms and stir until all are coated. If the mushrooms give off liquid, let that all evaporate before you move on to make the sauce. You don’t need to stir the mushrooms much, just let them brown and stir occasionally. 3. When mushrooms are nicely caramelized and tender, turn the heat to medium and put the pasta in the pot to cook while you make the sauce. 4. Add the shallots to the pan with the mushrooms and allow to soften a minute or two. Add seasalt to taste, I use a little over 1/2 a teaspoon, a few grinds of pepper and the rosemary or thyme. Stir for a minute or so until the herbs release their fragrance. Turn the heat up to high and add the wine. Allow the wine to reduce to about 1/2 a cup. Add the chicken stock and let that reduce to about half. The sauce should look a little creamy and have some depth when it’s reduced enough. Add the cream and allow to reduce a little. Taste and adjust seasoning as needed. Turn heat to low and gently simmer until pasta is done. 5. When pasta is done, toss everything together or serve pasta topped with mushroom sauce and sprinkle with chopped parsley and a little parmesan if you like. OMG, Margretta! This sounds perfect for a cold, rainy Seattle day. I can’t wait to try it! How fun to tramp about in the woods looking for the delectable chantrelle!!! PS Thanks for turkey recommmendation…I’m using it. I hope you like the turkey! Please write and let me know how it turns out for you.